Robin Dicks looks at the findings from the 2007 survey, in conjunction with PM Forum, on how Client Relationship Management is really applied in professional services firms. He also discusses how firms can strategically enhance their performance. Look at the promotional material, or website, of pretty much any professional services firm today.You’ll struggle to find one which does not describe how client focused it is, or the ‘special’ way in which resources and services are directed to the needs of its clients. It is clear that most firms recognise that good client service, and indeed good client relationship management, is an area which you should say you do. However, is it being delivered? Are firms really putting their money where their mouths are, and actually delivering on the promises on their websites? Are they consistently and systematically doing the things that would enable them to strengthen client relationships and thereby to win more business? And, if not, what are the lessons and opportunities for marketers within the professional services community? In late 2007 The Thriving Company Limited undertook a survey in conjunction with PM Forum to discover the truth, and not the hype, about what is happening in professional services firms.The outputs were also intended to be accessible and of value to members.Well over 100 firms responded, and the results make thought provoking reading. The survey was designed from two core perspectives.The first of these was given by the Gaps model of Service Quality. In brief terms, this model enables firms to identify the risks of not satisfying clients, and their root causes (see pm issue November 2006 for more detail) Participants in the survey scored themselves across 26 criteria inspired by the model. The second core was driven by a key interest which many Forum members have expressed – how to gain value from CRM systems and technology? Therefore we included nine criteria in this area, based on best practice deployment of CRM. How much do firms know about their clients? Do client needs and CRM programmes influence how firms operate? What impact is it having on fee-earners and marketers? 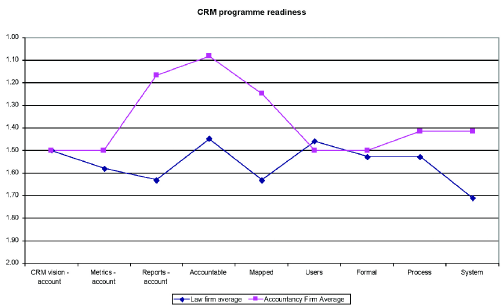 How well are CRM programmes being managed for benefit? The results are enlightening and provide a clear benchmark for firms and marketers about how they compare, not only to best in class, but to their peers in general.The information also allows marketers to determine where they may be at a competitive disadvantage. Some of the findings are shown below. In general terms, what is quite striking is the extent to which there are ‘early adopters’ and ‘laggards’ across the professional services environment. While most firms have recognised a need to gain appropriate client feedback, this is not true of all. Equally, a number of firms are attaining ‘best in class’ status by not only gathering client feedback, but working through how this is used and applied to enable partners and staff to deliver on the client promise. Some firms are grappling with issues of culture change, measurement, and gaining tangible results from investments in CRM technology. And in respect of CRM programme management, 64% clearly identify who is responsible for external relationships on the system – however only 38% of firms have set key success metrics of CRM programmes. It is also really noticeable, that many firms may not get optimal payback from their efforts. While they exhibit good practice in some areas, they haven’t worked on reducing the other risks that clients can be dissatisfied. So, for example, while client feedback may be gained, it may not be consistently tracked, action plans for employees set, or metrics governing the effectiveness of CRM systems established. If your firm looks like this, its worth reviewing how you can ‘join the dots’ more effectively. Can marketers learn from different sectors? The survey also reveals a wide disparity between the various efforts that firms are making. Examples of this are given in the graphic above. A key element of reducing the risk of client dissatisfaction is to ensure that the firm is effectively and accurately setting client expectations.This is not only through website and leaflet communications but the actions of partners, business developers and front line staff. To what extent do firms do this successfully? As can be seen, there are striking differences between some professional services sectors. 4 = does not do this. Six criteria (D1-D6) were used and included, for example, whether a firm’s partners and staff consistently communicate in a way which is consistent with the firm’s positioning and brand, and whether the firm is clear about what it expects from clients. As can be seen, on average accountancy firms perform most of the criteria to a large extent. But for law and property firms, the extent to which these activities take place is much lower. It is interesting that many firms attempt to secure benefits from CRM without a clear vision – or indeed without setting metrics to measure progress or define success. If this is true for your firm, it is worth seriously reconsidering. 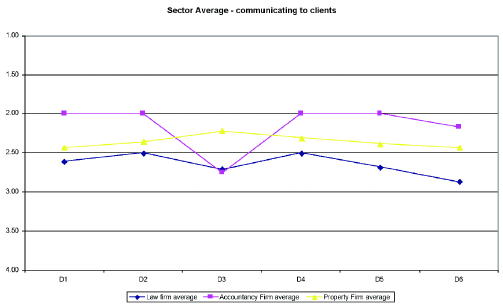 As the graph to the bottom left shows, it also seems that accountancy firms are more effective than law firms, at pro-actively managing and setting accountability for results around CRM programmes, and managing the performance of supporting technology.There are wide gaps in performance in four of the nine criteria here. How does your firm perform? Marketers should ask themselves how well their firm performs on these factors. If competitors are ahead on a range of them, given the increased demands of today’s market environment, the time to take action is now. If you’d like more information, or to benchmark your firm against your peers, the Thriving Company can provide you with a comparison of your firm’s capability and efforts, either against the overall results from the survey or a more specific peer group. Contact Robin on +44 7940 886677 for more details.